An article* I’ve just read reports that Lee Clark “has urged his Birmingham City players to accentuate the positive as they attempt, yet again, to end their St Andrew’s hoodoo.” I don’t know if that will work but I do know it’s not the mechanism that I employ to protect myself from psychological damage when going to games. I try to go expecting the absolute worst so that anything better than that will be a pleasant surprise. I wonder if Colin Tattum uses the same defence mechanism; in the video that the article links to, he listed all the reasons why Blues probably won’t win tonight. I go to games because I’m a fan and want to support the players. Also, I prefer to suffer in the company of other fans rather than to listen to radio commentaries in sombre solitude. I can understand why a lot of Blues fans are staying away but continue to hope that the low ticket prices for today’s game will entice more to come. 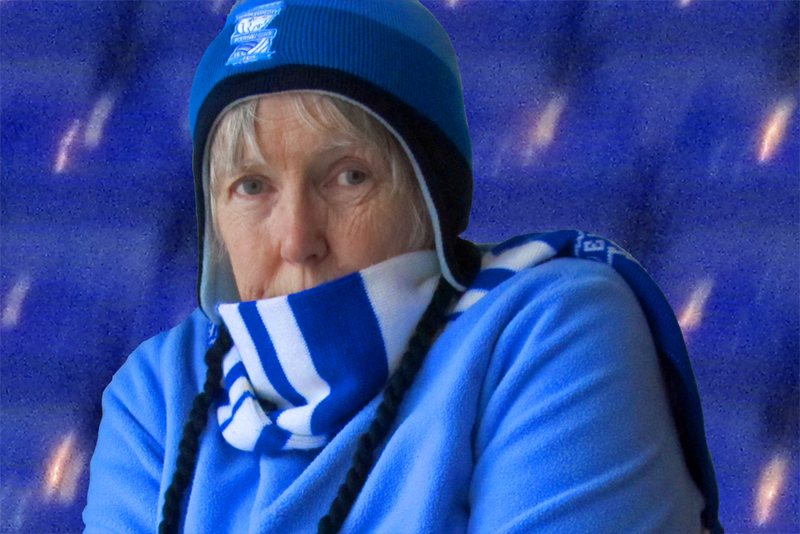 And I hope some of them will sit near me; it can get chilly at St Andrew’s when you are surrounded by empty seats. I won’t condemn fans that could come to the game but don’t; they have their reasons. Rob gave his reason for not attending regularly in his very sad comment on my last post; his kids don’t want to go. I wouldn’t tell parents that it was their duty to drag reluctant offspring to matches. However I would urge Rob not to give up all hope and try taking them to an away match sometime. Our team can lose away in the same dreadful way it can lose at home, but losing away usually doesn’t feel so terrible as losing at home. Travelling fans draw strength from each other in the face of adversity; they sing when their team is losing. There’s a valuable lesson that children can learn from supporting a poor team: bad things happen but you can get through them with a little help from your friends. This entry was posted in Birmingham City FC, Football and tagged Birmingham City F.C., Football on March 12, 2014 by Puddleglum.